Remove the complexities of VET Student Loan (VSL) and Higher Education reporting via Wisenet's data collection and reporting tools. 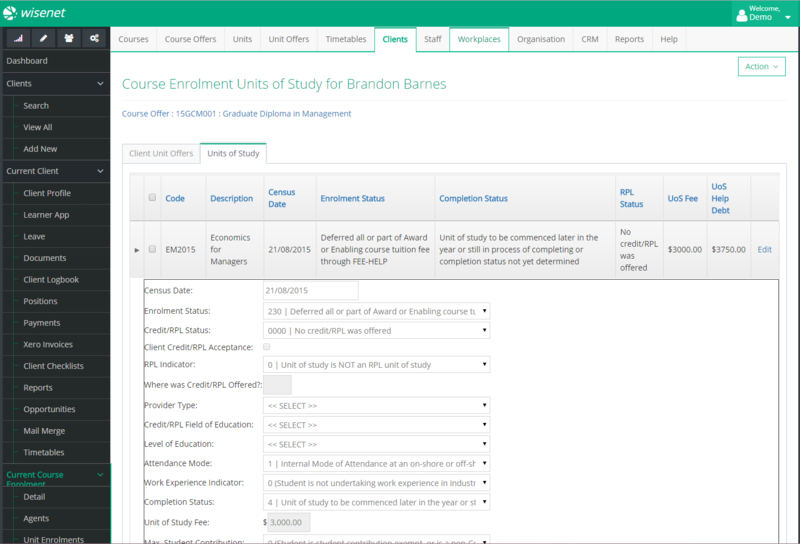 Looking for a VSL or Higher Education solution? Your search can end here. Wisenet removes the complexity of VSL and Higher Ed reporting. When combined with our comprehensive documentation and training, we offer our customers an easy path to generating revenue from an entirely new market of domestic students. Wisenet removes the complexity of VSL and FH reporting. When combined with our comprehensive documentation and training, we offer our customers an easy path to generating revenue from an entirely new market of domestic students. Wisenet contains all the relevant data collection fields and reporting mechanisms allowing RTOs to manage their VSL and FH obligations. Compliance managers can easily produce reports for submission to the relevant authorities. Our team of industry experts can assist you to ensure you are recording the correct information and maintain compliance. For more information on how Wisenet allows RTOs to manage their VET Student Loan and Fee Help reporting, visit our free Resource Centre. What is VET Student Loan? VET Student Loan (VSL) is an Australian Government initiative that allows eligible students to pay part of all of their course fees via a government loan known as VET Student Loans. This is specific to vocational education and training (VET) of higher levels (diploma and above). What do I need to do as a VSL provider? RTOs and HEPs (Higher Education Providers) must comply with specific regulations, data collection and reporting requirements. Providers must collect both AVETMISS and VSL data for any VSL courses being delivered. Learn how to become a VSL approved provider. What is FEE Help (FH)? For more information on VET Student Loans and FEE Help/Higher Education reporting, visit our free Resource Centre.